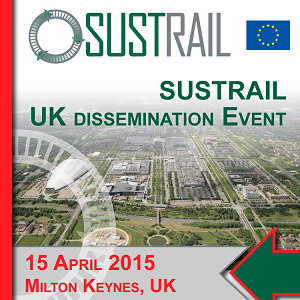 Within the framework of SUSTRAIL, Network Rail will be hosting a dissemination event on 15 April 2015 in its Milton Keynes facilities. More specifically intended to disseminate the results of the project towards the infrastructure and rolling stock experts based in UK and in the northern part of Europe, this workshop will give a brief overview on the project background and objectives and will showcase the innovations developed in SUSTRAIL to achieve the overarching goal of the project. Click on the icon below to download the draft programme. Secure your seat and register for the event by filling in the registration form available below.